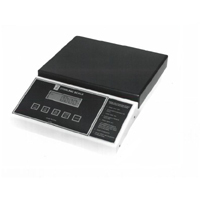 The Model 820 bench scale is a compact weighing scale which will weigh accurately in pounds, kilograms or grams. (selectable by pressing the unit key.) The weight is displayed on a bright easy to read LCD display. The enclosure is all steel, designed for industrial use.Â RS232Â output is standard to be used for a printer or a computer.